The Philippines used to be the number 1 producer of seaweed or carrageenan since the early 1990s. Seaweed farms ranged from Northern Luzon to Sulu and Tawi-Tawi. The sea between Cebu and Bohol had seaweed farms in the middle between the islands. Seaweed production was hampered starting in the early 2000s when funding from financial institutions shrank. The Development Bank of the Philippines (DPB) with its Export Finance Unit used to finance seaweed farms and processors based on Letters of Credit. The dynamics of financing and economic policy took its toll when Indonesia overtook the Philippines in carrageenan output in 2008. The Bureau of Fisheries and Aquatic Resources (BFAR) aims to increase output by 5% annually from 2017 to 2022. “We want to bring back the country as the world’s leading producer of seaweeds such as Euchema and Kappaphycus,” National Seaweed coordinator Irma Ortiz disclosed. Limited access to financing and credit, dependence on just supplying raw dried seaweed, stunted research and development that benefits seaweed production, lack of market promotion on seaweed products, poor aquaculture support infrastructures and mechanisms and climate resilient technology are cited for the decline in seaweed production. BFAR intends to meet these challenges via a 3 point program. 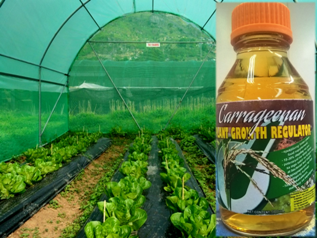 Carrageenan has also been developed into organic fertilizers for rice fields. Now, carrageenan are planned to be used for animal feeds. This will boost the demand for seaweeds products making the sector more productive and adding to the income of the farmers. The seaweeds for animal feed come from Pangasinan, La Union and Ilocos Norte. The by products are already being used in the United States and Canada. Last year, the country’s seaweed production slid 10.3 percent to 1.4 million MT due to the unavailability of planting materials of Cottonii variety, occurrence of disease, decreasing price from traders and high cost of planting materials. As with regards to the environment, seaweeds contribute to carbon dioxide capture and oxygen generation. The presence of abundant seaweeds reduces organisms that infest other marine life.